Hailing from Dublin, Silverbacks are a thrilling prospect, delivering their own louche take on NYC-indebted rock: slack enough for the tastemakers while also mining a particularly poppy vein, catching the ears of those with a taste for a good hook. 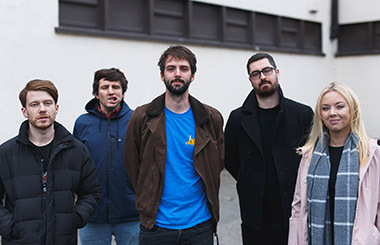 Now a full-fledged five piece after graduating from the bedroom project of songwriting brothers Kilian and Daniel O’Kelly, they ply their trade with as much emphasis on the dry humour running through Daniel’s lyrics as the propulsive, triple guitar-led onslaught in their music. Last year’s Sink The Fat Moon EP had the band lighting up their homeland’s media outlets, with nods from BBC’s Across The Line, The Irish Times, The Thin Air and Nialler9 amongst others. They followed up with riotous single Just for a Better View before the end of the year, drawing more accolades and leading to a coveted radio session for Today FM’s Paul McLoone. – 50c per ticket service charge applies on phone, internet or creditcard bookings. Final ticket price may be higher from other outlets.